In 1830, she married Samuel S. Jackson, who also lived in the Cox house, and they continued living with her brother and his children. They had no children. In addition to managing her brother's home, Rebecca worked as a seamstress, one of the most common occupations for black women during that period, even after getting married. In July 1830, at age 35, Rebecca experienced a religious awakening during a severe thunderstorm. For years, her fear of storms had been so great that, "In time of thunder and lightning I would have to go to bed because it made me so sick." On this day, she was unable to contain her fear, convinced that she would die during the storm. In her moment of greatest despair, as she prayed for either death or redemption, she suddenly felt as though "the cloud burst," and the lightning that had been "the messenger of death, was now the messenger of peace, joy and consolation." After this revelation, Rebecca began to experience visions in which she discovered the presence of a divine inner voice that instructed to use her spiritual gifts. She claimed that in these dreams she could heal the sick, make the sinful holy, speak with angels and even fly. She left her husband's bed to live a life of "Christian perfection." Her inner voice instructed her "to travel some and speak to the people." At first, Rebecca recounted her visionary experiences and held prayer meetings in people’s homes. She soon developed a large following – inspiring both blacks and whites, mostly women – through neighborhood "Covenant Meetings." She was harshly criticized for "aleading the men" and for her refusal to formally join any church, which several Methodist ministers saw as "chopping up our churches." 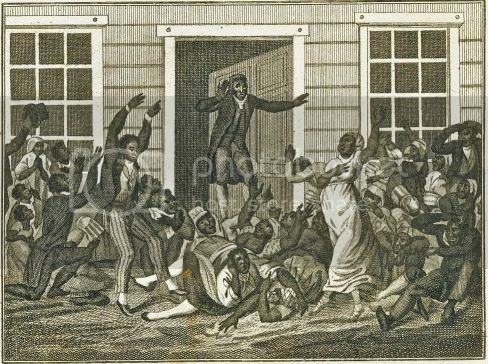 Morris Brown, who succeeded Richard Allen as Bishop of the AME Church, came to a meeting led by Rebecca with the intention of stopping her; but after listening to her, he declared, "If ever the Holy Ghost was in any place, it was in that meeting. Let her alone now." Yet Rebecca was still frustrated by her inability to read and write. Her brother had promised to teach her, but had not been able to do so, being tired every night. She resolved to "not think hard of my brother, … [who] had always been kind and like a father to me." She continued to rely on him to read and write for her. Until she realized he had made substantial changes in letters she had dictated. I picked up my Bible, ran upstairs, opened it, and kneeled down with it pressed to my breast, prayed earnestly to Almighty God if it was consisting to His holy will, to learn me to read His holy word. And when I looked on the word, I began to read. And when I found I was reading, I was frightened – then I could not read one word. I closed my eyes again in prayer and then opened my eyes, began to read. So I done, until I read the chapter. Now Rebecca Jackson had access to the Bible, and she used it to defend her practice of "holy living." She had intense criticism from her husband, her brother and the AME clergy who objected to women preaching and her radical notion of celibacy even in marriage. With a revelation that celibacy was necessary for a holy life, Jackson had criticized churches for "carnality." Some ministers threatened to expel their church members who let Rebecca into their homes during her travels. By 1837, at the height of the accusations against her, Jackson requested that Methodist and Presbyterian ministers formally try her for heresy. The request was refused and she cut off all ties to her husband, her family and the church. Rebecca became an itinerant preacher, and for the next 10 years, she traveled and preached around Pennsylvania, northern Delaware, New Jersey, southern New England and New York. During this time, she discovered the United Society of Believers in Christ's Second Appearing (known primarily as the Shakers), whose religious views were surprisingly similar to hers. She was attracted to the sect's practice of celibacy and recognition of the feminine, as well as the masculine, aspects of God. Impressed by Rebecca's spiritual gifts, the Shakers welcomed her as a prophet. In 1847, Rebecca joined a Shaker community at Watervliet, New York, and lived there for four years. Although devout in her commitment to Shaker doctrine, Rebecca was not satisfied with Shakers' outreach to blacks. A conflict over authority led her to return to Philadelphia with her companion and protege Rebecca Perot in 1851. In Philadelphia, Jackson established a small Shaker family that was predominantly black and female. After six years, she ended her estrangement from the Shakers and returned to Watervliet, where she spent a year. Jackson then returned to Philadelphia to establish a Philadelphia family of black Shakers – this time with the moral, legal and financial support of the Shaker society. The Shaker family that Jackson founded in Philadelphia in 1859 combined elements of Shaker theology and black female praying band traditions. It consisted of anywhere from a dozen to twenty members, mostly but not exclusively black and female, living together in a large house on Erie Street. Other black Shakers in and around Philadelphia also gathered there for services. Jackson's diary entries end in 1864. When Rebecca Jackson died in 1871, she was buried in a Shaker community in New Lebanon, New York. Rebecca Perot then took the name 'Mother Rebecca Jackson' and assumed leadership of the Philadelphia family, which survived another forty years. When Perot and other elderly sisters retired to Watervliet in 1896, it was believed that Jackson's colony had come to an end. However, that same year, in his pioneering study of black Philadelphia, W.E.B. DuBois found two Shaker households in the seventh ward. After Jackson's death, Alonzo G. Hollister, a Shaker leader, collected her writings (including an incomplete narrative of her life) and interviewed Philadelphia family members. For some reason, he was never able to produce a complete, edited manuscript. Rebecca Jackson remained virtually unknown until her manuscripts were rediscovered and published in 1980 as Gifts of Power: The Writings of Rebecca Cox Jackson, Black Visionary, Shaker Eldress.